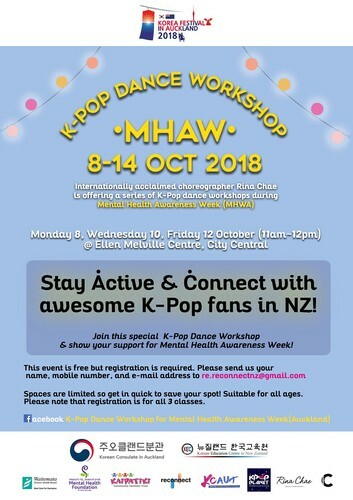 The Consulate of the Republic of Korea is running a series of free K-Pop dance workshops to celebrate Mental Health Awareness Week and Auckland’s annual Korea Festival. The dance classes will be led by internationally acclaimed choreographer Rina Chae and 12 Auckland schools will be selected to take part in a total of 24 classes. An additional three sessions are open to the public during Mental Health Awareness Week (8-14 October), which falls during the October school holidays. Korean Consul General Baekwan Hong says supporting Mental Health Awareness Week shows the Consulate’s commitment to raising awareness of mental health and mental illness in New Zealand. Hong hopes the workshops will be an opportunity to introduce K-Pop to more New Zealanders and encourage them to make new friends, keep active and ultimately stay healthy – physically and mentally. He feels the workshops align with the Mental Health Foundation’s Five Ways to Wellbeing (Keep Learning, Give, Be Active, Take Notice and Connect) – five simple actions proven to boost wellbeing. The workshops are open to the public, but spots are limited for each class so please register your interest. To enrol, email your name, contact details, and a number of people who wish to attend to re.reconnectnz@gmail.com.